BANGKOK, Nov 23 – Thailand’s auto production in the fourth quarter of this year is projected to shrink by 44-55 per cent year-on-year due to the recent flood crisis, Kasikorn Research Center (KRC) said on Wednesday. The think tank forecasts that the country’s total auto production in the last quarter of 2011 will dip to 200,000-250,000 units, a 44-55 per cent decline. Due to the significant drop, this year’s overall production was projected to fall 7-10 per cent to 1,485,000-1,535,000 units, dropping from 1,645,304 units last year. Meanwhile, total auto exports are likely to dive by 11-15 per cent, accounting for 765,000-795,000 units, the centre said. The worst flooding in decades is likely to drag domestic auto sales in this year’s fourth quarter down to 125,000-155,000 units, falling by 36-49 per cent year-on-year. Therefore, 2011 overall car sales will likely to drop by one to three per cent to approximately 795,000-825,000 units, down from this year’s earlier targeted 920,000-950,000 units, and from 800,357 units one year earlier. 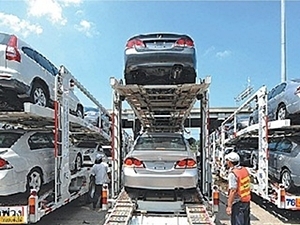 After the flood situation eases next year, KRC predicts that the government’s first-car buyer scheme will drive demand and stimulate the country’s auto sales once again. The first-car buyer scheme will continue until Dec 31, 2012 in order to help middle-income earners otherwise unable to afford buying their first cars. Car owners can redeem compensation from the government equal to their vehicles’ excise tax of not more than Bt100,000 after one year of possessing the vehicle. Meanwhile, the flood-related impact on the auto industry will be minimised and mitigated next year driven by resumed auto production and the government’s stimulus measures, the centre forecast. The deadly inundation caused many Thailand-based leading Japanese automakers to halt their operations since October, however, most companies, including Toyota, Isuzu Motors, Nissan Motor Thailand, Mitsubishi Motors Corp, Mazda Motor Corp, and Hino Motors, currently have partly resumed production. The centre is concerned, however, to restore foreign investor confidence regarding several issues, particularly long-term disaster preventive measures and the rehabilitation plan.